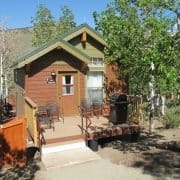 Mono Jim is a newly built studio cabin opened in April 2012, sleeps 2, nestled in the Aspen trees with views of Laurel Mountain and Mt. Morrison. 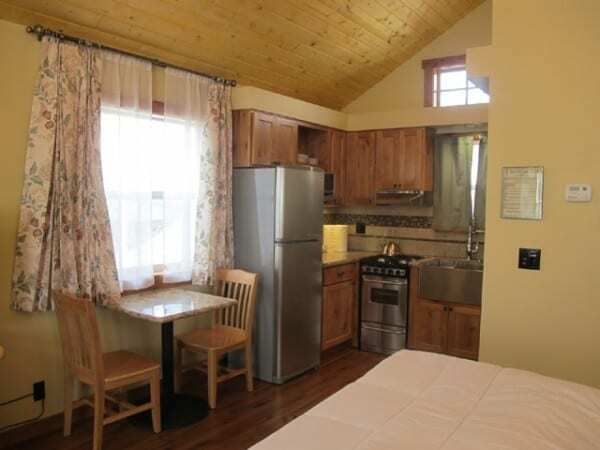 The cabin is located above our lower lake loop with easy access to the restaurant and general store. This cabin sleeps up to 4 persons. 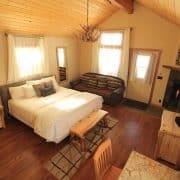 Furnished with mountain elegance and charm, the grand room is abundant with sunshine and mountain views, has high vaulted wood ceilings, a sparkling chandelier over a luxurious king bed, a relaxing fireplace, a sofa, an entertainment center with 40″ LCD TV and DVD player. 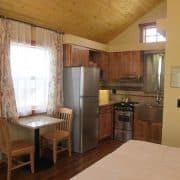 The kitchen is complete with granite counter tops and dining table, stainless-steel farm style sink, stainless-steel gas range/oven, refrigerator, and microwave, a coffee maker, toaster, crock pot, blender and all of the essential cookware and serving ware. Spend the evening out on the deck complete with patio furnishings and personal propane grill. 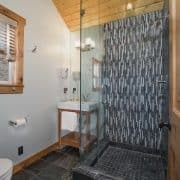 Step into a sumptuous glass shower with distinctive tile work and relax after enjoying a day of fishing, hiking or many other Eastern Sierra recreation activities. 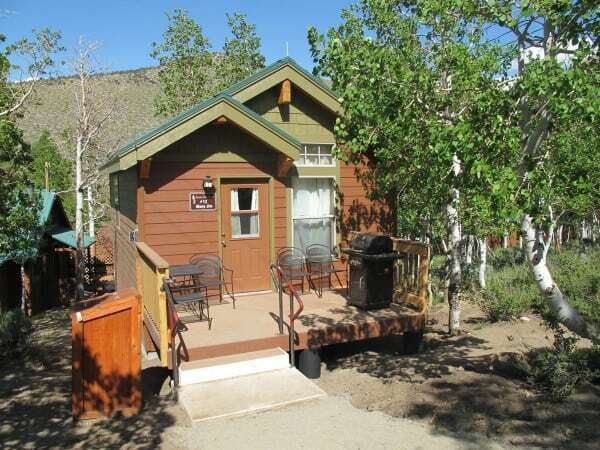 Amenities include DirecTV, DVD player and WI-Fi. We furnish coffee, tea, hot chocolate, dish soap, dish towels, paper towel, new sponge, bath towels, mats and wash cloths, soap, shampoo, conditioners and, lotions. An iron is provided and propane is furnished for the grill. 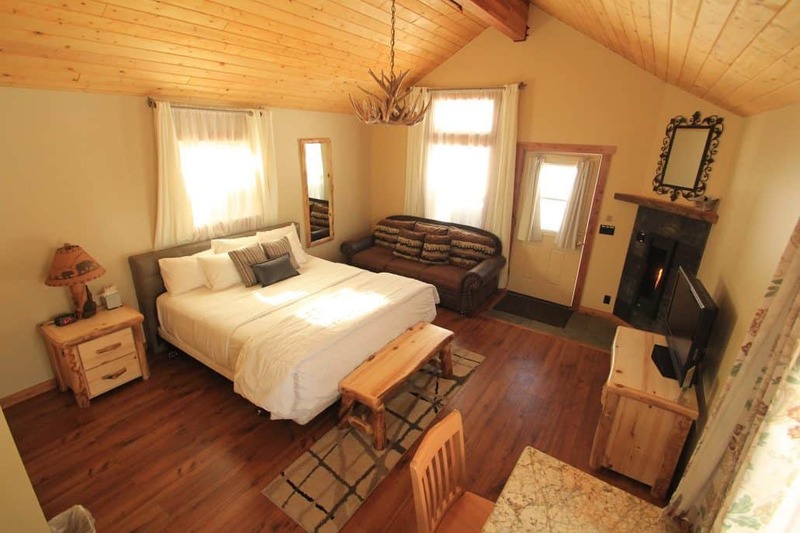 All cabins are nicely decorated with triple sheets, blankets, comforters and pillows on the bed. 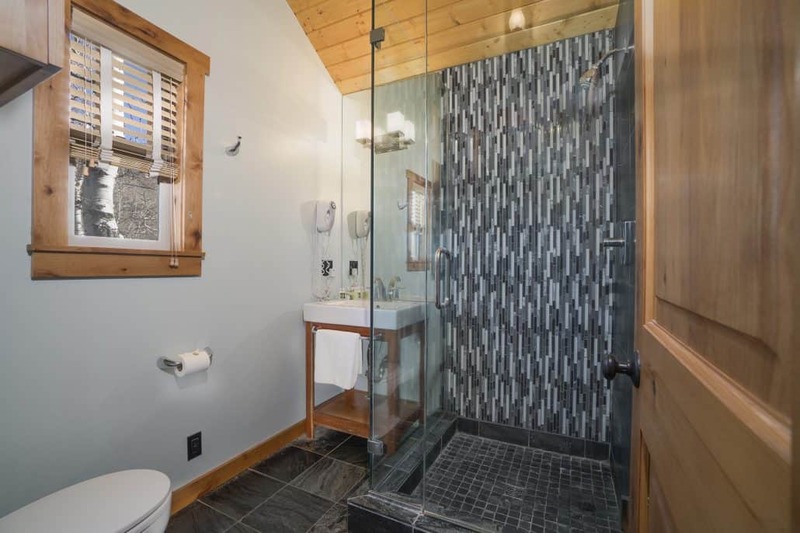 THIS CABIN HAS A MAXIMUM OCCUPANCY OF 4 PERSONS.